There are some eyeglasses, which may be worn by sims but don't appear in CaS or Bodyshop. You may know what I mean if you use a mod that makes glasses available for townies. This mod makes those 24 eyeglasses visible in the catalog, so you can use them whenever you want. UPDATE (28 DEC 2018): Fixed round eyeglasses and rectangular orange sunglasses for teen males, they were distorted on many faces. 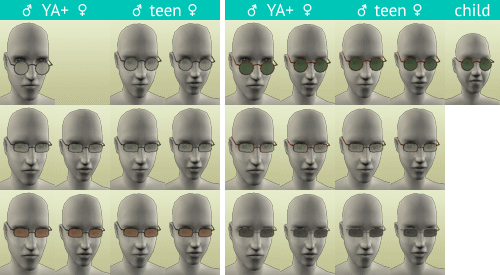 Added rims to both pairs of rectangular sunglasses for male adults, in order to make them look the same as for other genders and age groups. After you install or update this mod, delete the Accessory.cache file from Documents\EA Games\The Sims 2 or Documents\EA Games\The Sims 2™ Ultimate Collection. 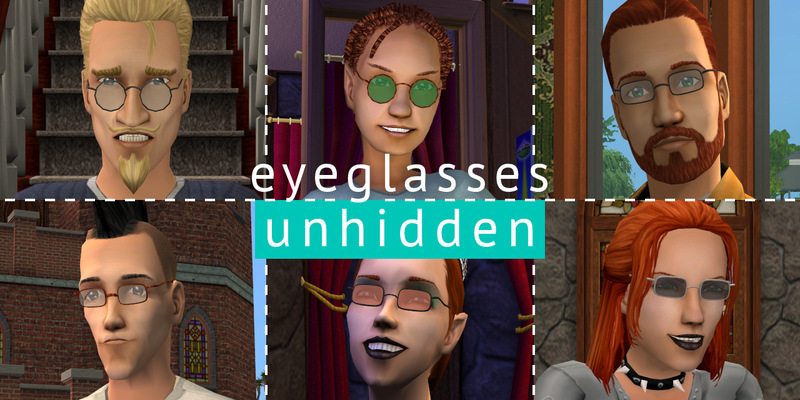 If aforementioned eyeglasses were already worn before the update of this mod, they will not be affected – you will have to change the appearance of Sims wearing them (using a mirror or a hack) manually.